Contact the owner at 850-830-six one five one...REDUCED $3,600!!! 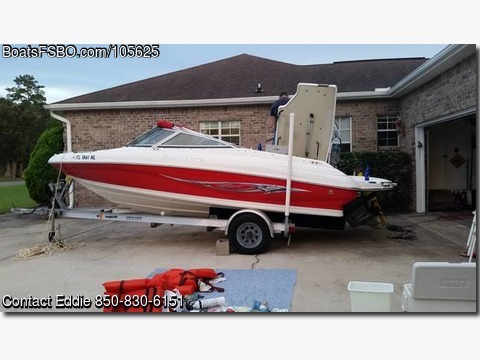 Beautiful 19'2" Rinker Captiva Bowrider w/Swim Platform 21'01". Volvo 4.3L with 8 person capacity, Includes 2007 Magic Tilt trailer (swing toung). New trim motor just installed. Recently serviced with oil change, new throttle cable, new battery and new Nav Lights. ($2,700 in upgrades) Walk thru transom, bimini top-canvas package, removable Igloo carry on cooler, Clarion Marine AM/FM/CD Sirius Ready, 4 in 1 gauges with digital depth gauge, large aft Sunpad, Swim platform with Telescopic ladder, 2 anchors, life jackets, brand new wake board and tow rope w matching ski jacket. Includes new $250 boat cover.